Hannah Otten grew up in upstate New York, living both near the banks of the Hudson River and within the Catskill Mountains. 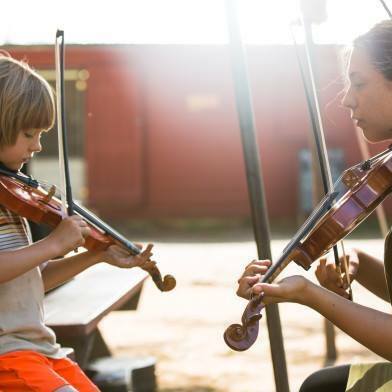 She began playing classical viola at the age of 9, picked up a violin at age 15, arrived at Maine Fiddle Camp, and kept on playing traditional fiddle styles from there. Hannah has a clear and playful teaching style that serves camp well as a member of the beginner team. In addition, Hannah is a contra dance caller and has called dances in northeastern NY and throughout New England, and she has also been an Irish step-dancer since childhood. When not playing fiddle (a rarity), she can be found tending her garden, driving ambulances as an EMT, and contra dancing/calling.